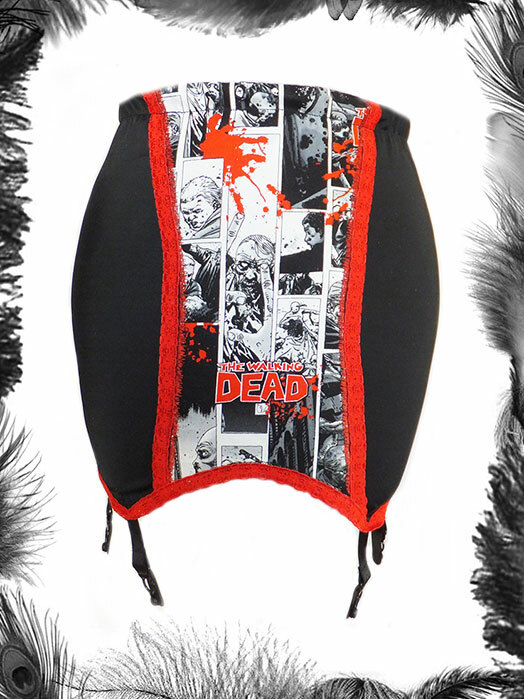 The Walking Dead Comic Print & Lace Girdle. Made from top quality strong lycra powernet type fabric . Trimmed with red stretch lace. 6 strong elasticated suspender attachments. Length at centre front: 10.5 inches. Gives you a fab shape and doesn't roll up so you can wear it all day. Matching cami top also available in store. Important Design Note: The front print layout may differ due to how each top is cut from the fabric. If you have any specific requests on this please email us when you place your order. Sizing: Please select which size is your natural measurements - the girdle will come in a size 2-3 inches smaller to give you that trimmer shape. So if your measurements are for instance 25-26 waist and 34-35 hips you would select the size 10. The size 10 girdle unstretched is 22 waist, 31 hips but then stretches to fit and shape. Your Size not listed? Other sizes can be made to order, just drop us an email. Please note larger sizes may be a little more expensive. Delivery - This item is made to order, normally despatched within 7 working days, but during very busy periods can take up to 14 days to be despatched. You can email us to find out what our delivery schedule is at the moment.